I'm expecting my second child at the beginning of May, and my almost-3-year-old daughter is very excited. We've been diapering, burping and rocking her dolls a lot, and she's entirely fascinated with the idea of having a new baby (let's hope the reality goes as well - maybe I should get a CD of a baby crying to play every now and then!). To prepare, we've been reading a lot of books about babies. Our local library has a pretty good selection, and we've bought and borrowed some from friends as well. We've been reading a mix of fiction and non-fiction books. I always like reading book recommendations from other parents, so here are my reviews on a few of the books we've read so far. 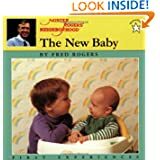 I love the Mister Rogers 'First Experiences' series of books. The photos are definitely from the '80s, but kids don't know or care, and as a parent it's kind of fun seeing those blast-from-the-past photos! In terms of content, the text in this book is very straightforward and respectful towards children. It tells them about what will happen when the baby comes home, how some children feel about having a brother or sister, and it has lots of large, engaging pictures of black and white families. It also shows photos of babies being bottle fed and nursed (all photos are very tasteful). This is another book with dated photos, but this is a great explanation of what happens in the hospital. It doesn't talk about labour and delivery, but focuses on the mother's stay in the hospital after the baby is born. It shows pictures of hospital rooms and nurseries, and explains that the hospital staff will take care of the mother and baby. It shows children visiting the hospital, and explains how they should behave (no running or yelling, hug Mommy gently, etc.). The book also shows different methods of feeding. Some of the information may not fit with your hospital's policies (for example, there is no nursery in my hospital anymore - babies stay in their mother's rooms for the whole hospital stay), but that is easy to edit when you're reading. Amazon doesn't have this book for sale anymore, but we borrowed a copy from the library. My daughter really liked this one! "Mommy loves me. Daddy loves me. I am special to them. I'm the only me in the whole world! I'm special in a new way, too. I'm a big sister now!" My daughter loved that the character in this book looks like Ashley from Joanna Cole's book My Big Girl Potty (which was a favourite around here for a while). By the way, it looks like she's released new editions with another illustrator. From what I can see in the preview, it looks like the story is the same (girl edition, boy edition). We received this book as a Christmas gift, and it was an immediate hit. It tells the story of Kate, who just became a big sister. She loves her brother Daniel, but finds it hard to understand why things are so different now. She has to wait for her parents' attention, and she sometimes feels like she's been forgotten. But her parents praise her for being such a good helper, and she gets to do fun things that the baby can't do. I really like the illustrations in this book, and some of the frazzled parents' facial expressions are hilarious. It's also nice to see a typically messy house - who has time to tidy up when they have a new baby?! Annette Sheldon also wrote Big Brother Now. I haven't read that one, but I imagine it's pretty much the same story. This book is very cute, although it doesn't explain much about babies! It's the story of a little girl who wonders what the "special something" in her Mummy's belly could be - a crocodile? a monkey? a kangaroo? At the end she meets her baby brother, and now her parents have two special somethings. There are several different covers to this book. This book is an illustrated non-fiction book. It answers many of the questions that children have about pregnancy, like "where is the baby?" "how did the baby get in there?" "what does the baby do all day?" and "can the baby hear me?" It contains diagrams and some medical language, and if you're uncomfortable with that (or if your child is too young for a detailed explanation), you may want to skip parts of the book while you're reading. 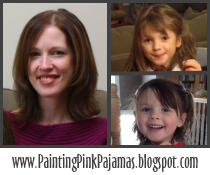 My daughter is not yet three years old, so I found that we glossed over some of the topics. It's nice to see a book that gives kids the facts though, and I'm sure it will be a useful teaching book when my daughter is a bit older and asking more questions about the mechanics of pregnancy! This book was my least favourite new baby book. After Angelina's baby sister is born, she feels ignored by her family. She has a hard time dealing with her feelings, so she has a tantrum and trashes her room, breaking a special statue in the process. She also says at one point that she hates her baby sister. Although I'm sure some children feel and act this way, my daughter often repeats things from books, and I didn't want her using this kind of behaviour or language, so I edited it quite a bit while reading. By the end of the book, Angelina likes her baby sister and feels loved by her family again, but that wasn't enough to redeem it in my eyes. We returned this book quickly! 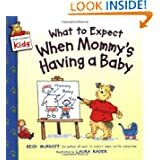 I hope these reviews are helpful to those of you going through your own pregnancy journeys, and looking for books to prepare your children for a new baby! I'll review another batch of books soon. The pictures are a tad dated on some of those books. Haha! That is hilarious! I am so glad maternity clothing has come a long way. :-) What great suggestions. I know a ton of blogging mommies expecting another one. Congrats and I hope the books help with the transition. Congrats! I really hope to have another one by the time my son turns 3 next year, so this is a great compilation of books to get my son prepared. This is a great post! I love the theme of preparing for a new baby. I'm glad you didn't try to edit your post at the last minute. I just don't want it to be too overwhelming for the writers or the readers so we settled on 1-3. I'm so happy to have you join us and hope that we will get to see more of your fav. books on Fridays! I bought a book called "God gave us two" for a friend's daughter. The main characters are polar bears. Gotta love 80's pics! I like how you shared why you disliked a book as well.This is just the kind of helpful info I was looking for. I wish I was expecting #2 so we'd have an excuse to read these. Great idea! I did this when we were expecting our 3rd. Your 2nd was only 19 months when Micah was born so I wanted to prep her as much as possible! Janna > Glad to participate! Thanks for the book recommendation! What a helpful list! I will be needing these books someday! Congratulations on the bun in the oven! I agree with you about Angelina's Baby Sister! We edited it as well. Another book we love is "The Baby Sister" by Tomie dePaola. It is very cute! I wonder if my daughter would understand anything from those books, as she is only 1. I find it hard to figure out how to tell her what is going to happen in 3 months. I'm also needing a book that explains it to a very young child. I've tried explaining things to my 16 month old, but I don't think she gets it!